Wine glass news and reviews. Is there such a thing as a perfect wine glass? Can the right glass make a wine taste better? Can a mediocre wine be improved by a wine glass? Surprisingly, the answer to these questions is “yes“. We’ve tried a variety of wine glasses, and we’ve found a couple that are demonstrably different than the rest. You almost certainly won’t find these glasses in your local supermarket, housewares store, or discounter. Maybe, just maybe, you’ll find them in your local high-end wine shop… if you are lucky enough to actually have a high-end wine shop in your area. Once you’ve tried them, though, you’ll be tempted to carry them with you to restaurants, wine tastings, and even dinner parties. This is the ultimate wine glass – its 30 oz. bowl concentrates the wine’s aroma while providing extra surface area to oxygenate the wine. Try this glass a few times, and you’ll be absolutely convinced that a glass can improve a wine. The “wine improvement” statement isn’t fantasy. There are a few real-life mechanisms at work. First, there’s aroma concentration. A typical 6 oz. wine glass has no room left over after you pour a reasonable portion of wine. Even if you pour only an ounce or two, what’s left? Four or five ounces of volume to collect the wine’s aroma. That’s fine if you are dealing with a highly aromatic wine, but many wines, particularly inexpensive ones, often don’t have a nose that’s sufficiently concentrated to let you detect their subtle nuances. 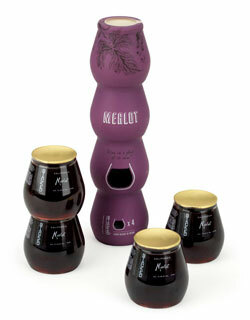 The Riedel Sommelier Cabernet/Merlot/Bordeaux Wine Glass, by comparision can collect 25 oz. or more of concentrated aroma – enough to take a deep breath filled with the molecules vaporizing from the wine surface. Detecting aroma is all about volume – a bigger breath of the wine’s nose will let you find those subtle vanilla, chocolate, and saddle leather notes the wine critics rave about. The last thing we can say about this glass has nothing to do with the wine you’ll pour into it. Instead, we want to tell you about the glass itself. Quite simply, it’s a work of art. The glass is big… huge… but it’s eggshell thin. If you tap the glass with your fingernail, it will ring like a bell. Despite it’s impressive size, it’s surprisingly light and easy to drink from. I can say with confidence that if you haven’t actually used one of these glasses, you haven’t experienced a wine glass like it before. While this glass is nominally for red wines, don’t be fooled… it’s great for white wines, too. The same aroma concentration effects will let you sniff out those delicate citrus, apple, and mint scents in your favorite whites. If you are serious about wine drinking, or even if you want to make the most out of your $5 – $10 wines, consider investing in this glass. Think about it… if you can turn a $6 wine into a $20 experience, this glass will pay for itself in a month or two. And, the glass will last for hundreds of bottles of wine. This entry was posted in Wine Glasses on June 9, 2006 by Roger. We’re introducing a new feature here at Box Wines – reviews of wine glasses and other products we’re lucky enough to sample. Check out our first review, the Riedel Stemless Tasting Glass. Watch for more reviews in the future. This entry was posted in Wine Glasses on May 5, 2006 by Roger.